In the process of selecting a new mixer for my church, I wanted to research every option available. In the process, I created a spreadsheet comparing the features and specs of digital mixers, available at the time, that were within our price range. You’ll find a link to it at the end so maybe it can help you as well. It was important it be thorough enough that I could look in one place to find what would and wouldn’t work for us. I included basic specs such as number of channels and inputs/outputs, as well as needs that were specific to my church, like whether a direct output could be set to tap off before the compressor. During this time, my church had a Roland M-400 mixer, sold to us by a local integrator when our Mackie TT24 gave out. The mixer proved to be very reliable and had more than enough available channels and inputs. However, it provided no method of allowing the musicians on stage to mix their own monitors, unless we spent thousands of dollars on their personal mixing system. Also, the Roland had no method of remote control aside from a PC editor. The lack of scribble strips made re-arranging channels a tedious chore. It did provide a custom user-layer, but without LED scribble strips that changed with the layer assignments, the user-layer was essentially useless. The church had serious issues with stage volume. Guitar and bass amps on stage made mixing at a reasonable volume level nearly impossible. Mixing monitors from the FOH position was not working out for the team. We needed an in-ear system. We needed a change. I created a spreadsheet with all of the mixers that fell within our price-range and started my evaluation. The Yamaha LS9 was no less expensive than the board we already had, and not much better off from a feature stand point. The Soundcraft Si Expression was available in our price range, but the cost to implement a personal mixing solution was still too significant, albeit much less than with the Roland. The Allen & Health QU32 and Yamaha TF series mixers didn’t yet exist at the time. I had previously looked at implementing a PreSonus StudioLive as a monitor only console, hooked up to the Roland system with an analog split. We decided that was a bit too much of a mess to try to implement. At this point we only had two options, the StudioLive or the Behringer X32. The X32 was still very new and a hot topic within the audio community. I was skeptical of it at first considering the company’s history, but our local pro audio shop offered to let us demo it. After testing it, I wasn’t 100% sold because I ran into a number of minor issues including an occasional pop in the system; however, at the price point of the mixer and even more-so the price point of the P16 personal mixing system, it was too good of a deal to pass up. We sold our Roland mixer and used the funds to purchase an X32 and P16 system. After the first Sunday with it I knew we had made the right choice. Not only did the mixer check nearly every box I had, it even sounded better! Afterward, I continued to maintain the spreadsheet I’d made of the various available mixers, knowing we would likely need to upgrade to a higher capacity mixer in the future, and knowing other churches may be in the same situation. My goal was and is to have one place people can go to see the differences, and determine which specs they can and cannot live without. 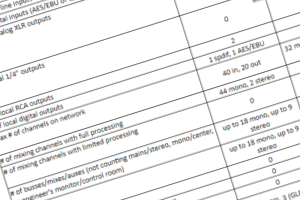 The spreadsheet lists the specs and features I found to be most important and lists them on the leftmost column. Across the top row are the model names of each mixer; it includes every digital mixer that I know of that has at least 32 channels and costs less than $10,000. Brian Henson is a musician and sound guy who can be found during the week doing tech support for Intel. Thanks for adding the A&H SQ series and Soundcraft Vi1 on the spreadsheet. I’m the current sound engineer for my church and im tasked with recommending a new mixer over the old analog unit… After painstaking research I’ve narrowed the search down to three mixers that happened to make your list. Behringer X32,Soundcraft Si Expression 2 and Yamaha TF3. Hoping to get your input on which one you like. Not sure if the X32 works with iPad and I plan on using Ableton click tracks…. These are three solid mixers. I’d look at either the X32 or the TF3, probably leaning toward the Yamaha. Is Midas M32 really 96khz? I would rather go for Allen & Heath SQ7. What is your take on this? I’d go with the SQ7. The M32 is getting long in the tooth. I found the dropbox link has no file linked to it. Could you help to upload the file back? Strange. I contacted the owner of the file and got a new link. Great work with the spread sheet! I just wonder why the Mackie DL32R isn’t in the lineup? Have you heats anything about it? I’m not sure. I think it’s because it’s an iPad driven console and he focused on physical mixers. I’ve used the DL32R and like it. That’s in Brian’s plan once they release the manual online so he can dig into the precise details. With all the sales going on for the Behringer X32, I am wondering if they are about to release a new model. As I am in the market, this idea has me hesitant to Jump in right now … but rather to wait and see what might be just around the corner. It seems like any more, new functionality is added via firmwarm software updates. I dropped for the new Presonus StudioLive 32 series iii after reading one of your recent blogs. Guess I’m off to the Digital Races.